So what was I going to make for dinner now? I had about 1 1/2 cups of cooked couscous left over from my summer fish in a pouch. I also had some nice big peppers from market. They are in season right now and they are really cheap! 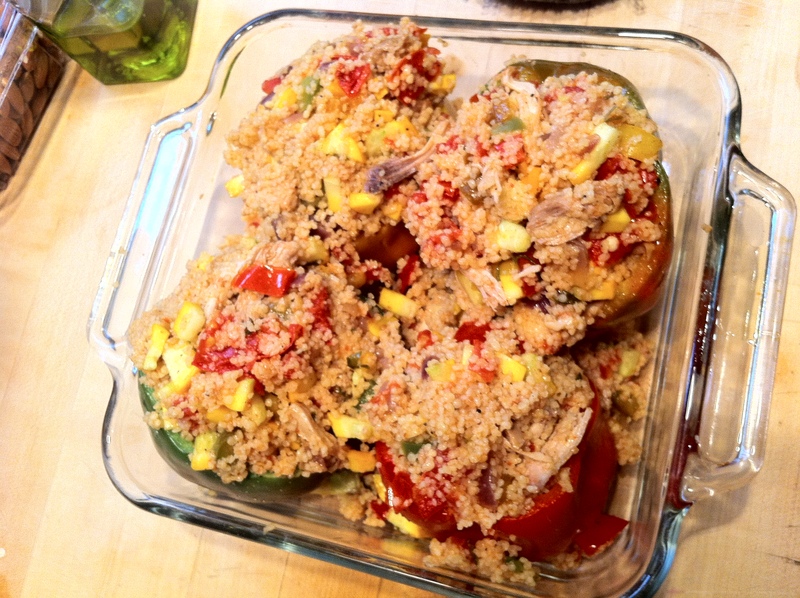 I decided to make stuffed peppers with chicken and couscous filling. 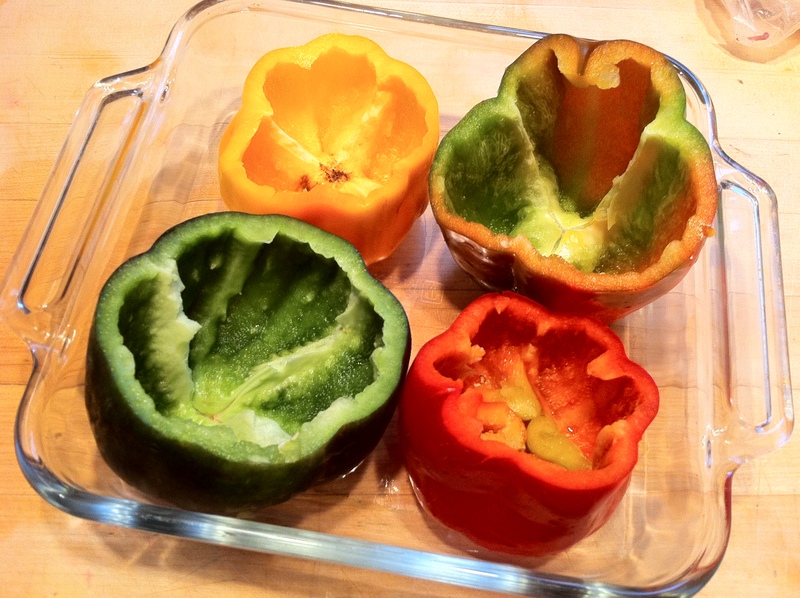 Cut the tops off the peppers, remove the seeds and place them in a 9×9 inch baking dish. Season the chicken thighs with salt and pepper on both sides. Coat a deep saute pan with olive oil and saute the chicken thighs until a nice golden crust forms – don’t remove all of the excess fat from the thighs, you want a little bit to render in the pan to give it a deeper flavor. Saute the onion and garlic with the chicken for about two minutes. Add 1/2 cup of chicken stock to the pan – the chicken stock will help you deglaze the pan – so scrape up all those good little brown bits, they have lots of flavor in them! Add the tomatoes into the pan, season with salt and pepper and cover. Bring the mixture up to a bubble and cook over medium heat for about 5 minutes. Pull out the chicken thighs and shred them. Small dice your yellow squash and mix it into the left over couscous. Make sure you break up the couscous because sometimes is gets clumped together in the refrigerator. Mix the chicken, basil, and the tomato mixture into the couscous. divide the mixture and spoon it into each of the peppers. You may have to push down and mound it in the peppers. Use it all! It’s ok if the peppers are overflowing. Pour the other 1/2 cup chicken stock into the bottom of the baking dish. Drizzle some extra virgin olive oil over the tops of the mounds of couscous. Cover the dish with aluminum foil and bake at 350 degrees for 30 minutes. 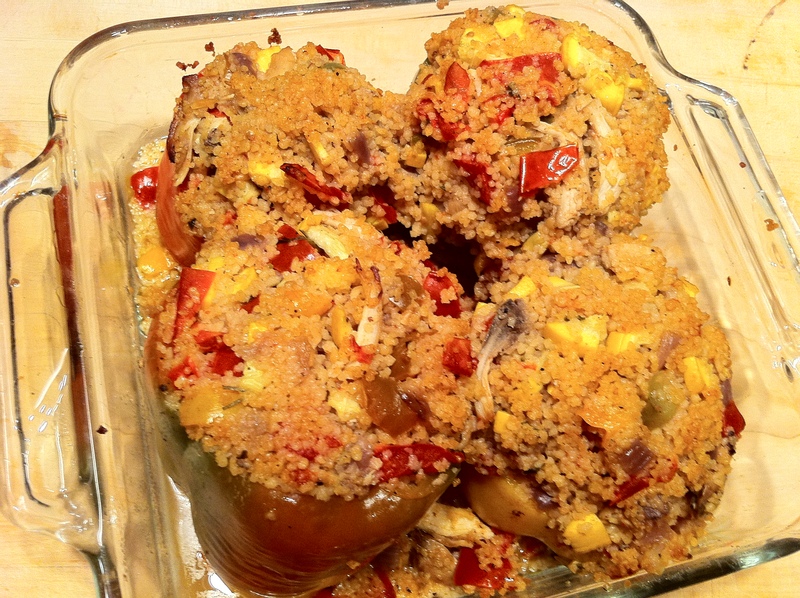 The couscous filling won’t look that much different once it is baked, but the peppers will be soft and juicy. The chicken stock that we added to the bottom of the dish before baking keeps everything nice and moist. This is a great all in one dinner, no sides needed… and you used your leftovers!